New funding to develop promising anticancer molecules into targeted drug delivery systems. A major goal for medicinal chemists is the discovery of drug molecules able to selectively kill cancer cells and reverse multidrug resistance, a serious problem by which tumours develop resistance to chemotherapy. 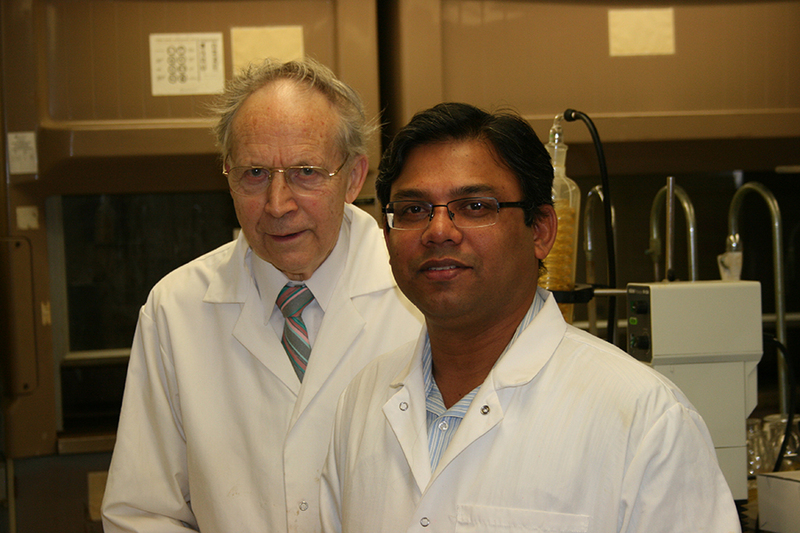 Recently, Emeritus Professor Jonathan Dimmock and long-time collaborator Umashankar Das discovered a number of promising potent anticancer molecules. Now, with a 3-year $270,000 grant from the Maunders McNeil Foundation, the research group will conduct studies with selected patented compounds aimed at enhancing their potency, tumour selectivity, multidrug resistance-reversal properties, efficiency, and bioavailability. An important goal of this research is to create targeted drug delivery systems called antibody-drug conjugates, by attaching drug molecules to an antibody. Antibody-drug conjugates are proving effective at selectively killing cancer cells and sparing healthy normal cells. The efficacy of these drug-antibody conjugates will be investigated either locally or in collaboration with a pharmaceutical company.